Fruit box made of natural pine wood. Ideal for decorating shops, wineries, offices, restaurants, gift baskets, decoration....Measure - Interior of the box 45.5x28x24 cm..They can be personalized with a name or logo, with the size of the engraving not exceeding 30x5 cm. .
Fruit box made of aged pine wood. Ideal for decorating shops, wineries, offices, restaurants, gift baskets, decoration....Measure - Interior of the box 45.5x28x24 cm..They can be personalized with a name or logo, with the size of the engraving not exceeding 30x5 cm. .
Fruit box made of pine wood painted white. Ideal for decorating shops, wineries, offices, restaurants, gift baskets, decoration....Measure - Interior of the box 45.5x28x24 cm.. .
Fruit box made of natural poplar. Ideal for decorating or for gift baskets, fruit....Measure - Interior of the box 28.5x20.5x15 cm..They can be personalized with a name or logo, with the size of the engraving not exceeding 20x2.5 cm. . . Wooden basket made of poplar 1 cm. thick, suitable for feeding. Available in 2 sizes..Measurements - Square Interior 15x15x7 cm. 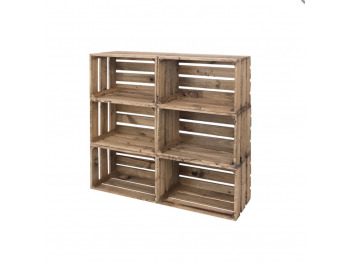 - Rectangular Interior 22.5x15x7 cm..We also tailor them for minimum quantities of 50 pcs. If you are interested please send us an email to request a quote. Inclined basket made of poplar. It is ideal for decoration, as a gift basket, to store toys, for everything you want..Measure - Interior of the box 33.5x22.5x18.5 cm..With handle for easy handling and transport. .
Set of 3 baskets boxes type to fruits, made of solid pine wood PEFC certificate. Total measures to choose, 5 mm thick. Large basket box 36x25x16 cm. 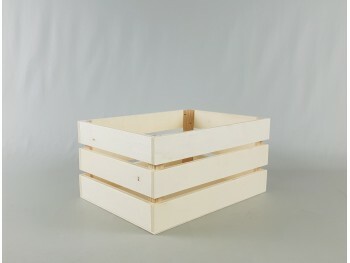 Medium basket box 30x22x15 cm. Small basket box 25x19x12 cm.